Get your technology under control with the best solution for IT support in Baton Rouge. IT issues have the potential to quickly break down your company’s operations. Affecting everything from productivity and employee morale to cost-efficiency and customer service, poorly performing technology is a recipe for nothing good. However, with Immense at your side, your team can avoid the fallout uncooperative technology can induce. Here at Immense, we offer the best solution for IT support in Baton Rouge. Whether you wish to supplement your internal IT department or you’re looking for dedicated, ongoing IT support, Immense is the answer. We have the expertise, tools, and resources required to keep your technology performing well and to help your team avoid IT-related issues and downtime. We are known throughout Baton Rouge because of our desire to build lasting relationships with our clients. Our ultimate goal is to make sure all of our clients are working with reliable technology, and we accomplish this by taking the time to fully understand every infrastructure we support. We don’t just hire people who know about technology. We hire people who are excited about technology. We are continuously improving our collective knowledge and skill set, and because of this, we’re able to completely transform the way our clients view technology. Since we’re excited about technology and we continuously improve, we have the ability to solve the everyday problems of our clients in unique and innovative ways. For example, our IT maintenance tool, ImmyBot, automatically sets up, monitors, and maintains individual workstations. Our dedicated IT support solution will allow your business to avoid the fallout of bad technology. This is because you will attach yourself to a solution that uniquely fits your needs. Our staff of IT experts will get to know your infrastructure and provide you with dedicated and customized IT assistance and solutions. As a result, your technology will not only remain healthy — but ahead of the curve. 27% of small businesses have no IT support. 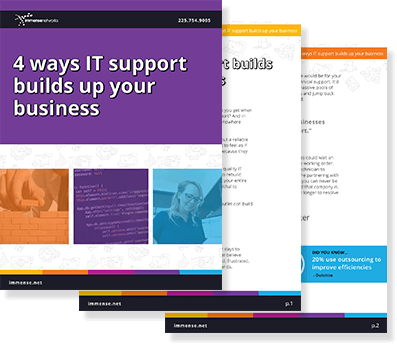 Discover the four reasons this lack of support can hurt your business. Do you have questions about IT support?